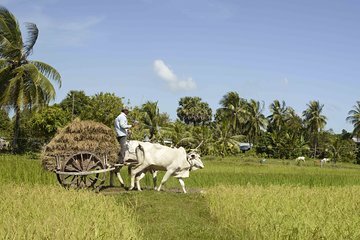 Discover lush rural landscapes as you ride a ‘moto’ (motorized scooter) or Tuk Tuk through stunning scenery and immerse yourself in the rhythm of Cambodia’s countryside. There are no normal “tourist” sights along this route, but we can make plenty of stops whenever we see farmers working in the fields or at scenic places and enjoy a rest, a photo and maybe a short chat with a local over a drink. If you’re able to ride a motorbike and have an appreciation for the smaller things in life, then this trip is for you. Options: : Route varies, according to season and road condition and has various extensions and shortcuts to suit all levels of motorbike skills.